Too Wheels is an open-source DIY toolkit to build a sports wheelchair. It's low-cost, adaptable and easy to build. Too Wheels provides a low-cost and adaptable DIY alternative to expensive ready-made sports wheelchairs. Makers are able to download the open-source wheelchair blueprint, adjust the design based on their unique measurements, and build the finished product from cheap and easily available materials such as plywood, metal tubing, and bicycle wheels. If built correctly, for as little as €200 anyone across the world can own a sports wheelchair with the performance of a €2,000 premade alternative. Fabrizio Alessi, founder of Too Wheels, first started designing the DIY wheelchair as a student after spending time volunteering with a disability charity. Although state funding in Italy, Fabrizio’s home nation, provides standard wheelchairs for disabled people, the more expensive wheelchairs required for playing sports are not covered. Using Too Wheels, children and adults alike are able to play a host of games including basketball, tennis, softball or rugby. Download and print the A4 manual. When the printed pages are arranged in the correct order, they form a 1:1 template of each individual part. Creators can then use materials and tools from any local DIY store to cut individual pieces to the required dimensions, based on their own body measurements. No specialist skills are required. Once the component parts are attached together, your sports wheelchair is ready to use! If a maker has access to a Computer Numeric Control (CNC) machine (found in your local Fab Lab), you can download the design in a digital format. When the digital design is input into the CNC machine, you individual parts can be cut automatically. Sports wheelchairs have been built using the Too Wheels open-source design in locations across the world. For example, a Too Wheels wheelchair was built in Ecuador's Fab Lab Yachay through a grant from the Fab Foundation. 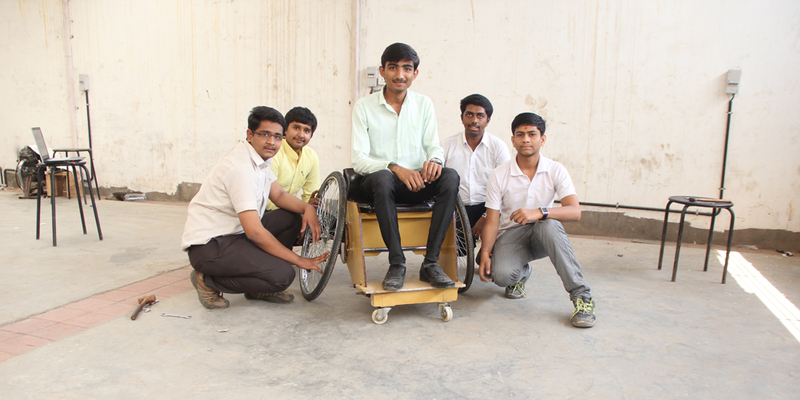 Elsewhere, students at India's Gujarat Technological Univeristy have built their own sports wheelchair. The Too Wheels building team at Gujarat Technological University. Building a viable business model around an open-source project has its own set of challenges. While the design of the wheelchair will remain freely accessible, enabling anyone to download and create their own wheelchair, there are other revenues streams available to open-source projects. Too Wheels hopes to build partnerships with charities and community organisations who will purchase premade wheelchairs, which are easily adjustable on site to fit individual needs. For example, Too Wheels are in talks with Icaro, an Italian non-profit organisation which encourages disabled people to get involved in culture and sport, to provide low-cost wheelchairs for basketball games.